You can custom design your own insulated medicine case wristlet or clip on case for your Epinephrine Auto Injectors or similar sized medicine. Once you have placed your order, you will receive a design form on your receipt with fabric options, thread colors, fonts, ribbons and more to choose from. The pictures listed are examples of a few of the cases we have done already. The space on the front of the case is limited for one word. In a smaller font, we can sometimes fit a full name. Most people put a first name or "EpiPens". If you need to write out instructions or additional information, please purchase the ICE panel which is described below. The insulation that we use is Insul-Bright. Insul-Bright consists of hollow, polyester fibers needle punched through a non-woven substrate and through a reflective Mylar. The needled material is breathable and won’t break down with washing. The hollow fibers resist conduction while the reflective Mylar resists radiant energy. The energy, hot or cold, is reflected back to its source. Insul-Bright is heat-RESISTANT, NOT heat-proof. When we tested it in extreme temperatures with both AuviQs and Epi-Pens in two cases (one with insulation and one without), the medicine was slower to get to high heat temps and freezing temps but, eventually extreme temps were reached. The medicines were cooked at 170 degrees in the oven, left in the hot sun all day and then frozen for three days. None of the medicines became cloudy (insulated or not). 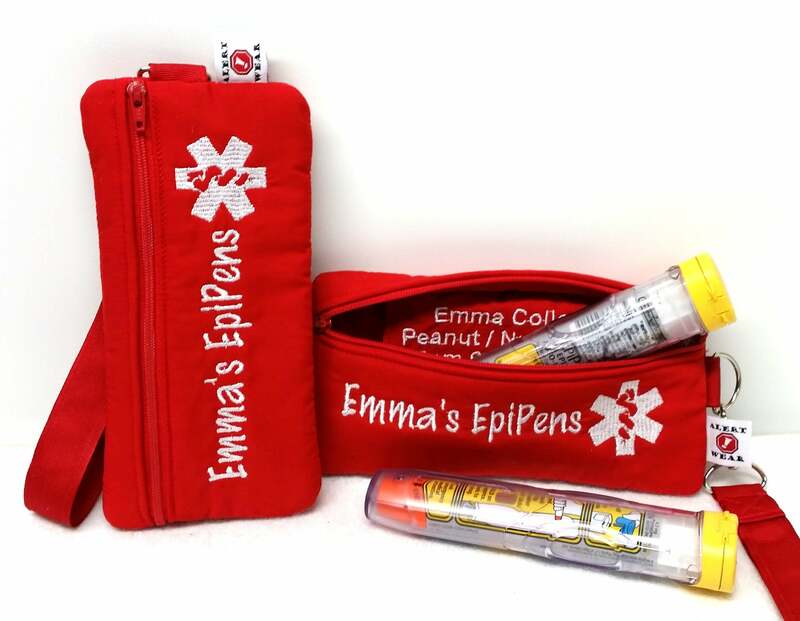 This case measures approximately 7.5" x 3.5". 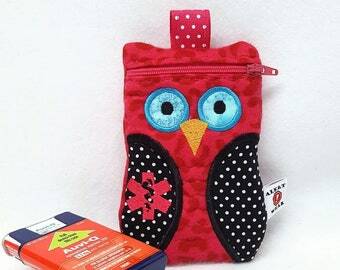 I can make it slightly larger to hold 2 EpiPens and an inhaler, however, if you need it any larger than that, please purchase the larger case: https://www.etsy.com/listing/254452480/larger-inhaler-case-medicine-pack-epi?ref=shop_home_active_24 This case can be made to look the same as the case shown here but, it would be larger. 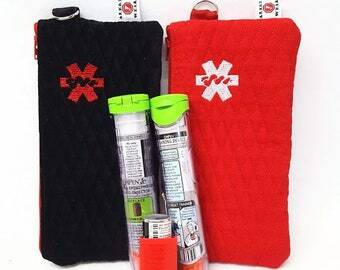 ICE Panel = In Case of Emergency Embroidered Panel. The emergency panel allows for 4-5 lines with 18-20 characters / spaces per line. Suggested information for the panel would be name, medical condition, basic emergency instructions and emergency contact information. You must order "Case & ICE Panel" for this to be included. This option is an additional $5. Giving this as a gift? See the last photo for a sample of gift wrapping. I will do my best to create a coordinating pillow gift box for the case. This option is an additional $5. Need some versatility? Add a removable waist strap! This option is an additional $10 when added with your order here. 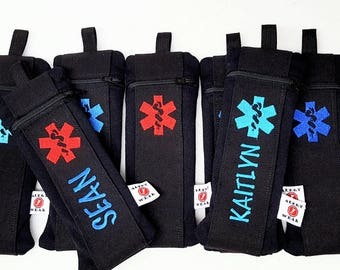 The option "Case, ICE & Belt" is for the waist strap, the case with removable wrist strap and in case of emergency info." I am so happy with this purchase. My sons 2 epipens fit perfectly. It is really sturdy and well made and it came earlier than expected. I will definitely shop here again! We are really happy about that case and have been using it for a few months now. It is sturdy, well made and the size is perfect. thank you! Just beware that taxes to import it in Europe will be really high (we paid about 40€).